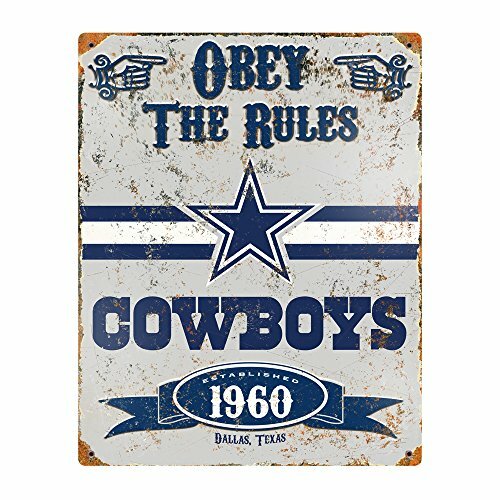 This attractive Dallas Cowboys embossed metal sign has an authentic vintage look that makes it the perfect addition to any bedroom, office, bar or fan cave. These 14.5" x 11.5" embossed metal signs have an authentic vintage look. Features a realistic weathered design and embossed lettering. Heavy gauge steel sign is drilled riveted in all four corners for easy hanging. Perfect addition to any fan cave, bedroom, or office. If you have any questions about this product by Party Animal, contact us by completing and submitting the form below. If you are looking for a specif part number, please include it with your message.